Know the warning signs of a myocardial infarction. A myocardial infarction is confirmed with these tests. Learn how we repair blocked arteries causing a myocardial infarction. We'll help you recover after a myocardial infarction. 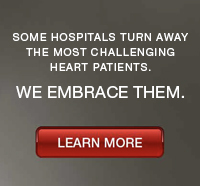 You’ll get exceptional heart attack care at Lehigh Valley Health Heart Institute. Our rapid heart attack care program, MI Alert for Heart Attacks, saves lives and working in partnership with local EMS providers, we are able to diagnose heart attacks and prepare for immediate treatment while a patient is enroute to the hospital. During angioplasty, a thin, flexible tube (catheter) with a tiny balloon at the end is inserted through an artery in the groin and guided into the artery that is blocked. Once at the location of the blockage, the tiny balloon is inflated. This flattens the fatty deposit and opens the artery. To keep debris out of the bloodstream, we use a special safety device during angioplasty that catches particles that sometimes dislodge from the side of the artery. Angioplasty is an important part of our award-winning, fast-action heart attack program, MI Alert for Heart Attacks. We educated local paramedics to diagnose a heart attack in the field and communicate their findings to our doctors. This allows us to prepare for a lifesaving angioplasty while the patient is on the way to the hospital, saving precious minutes. Our MI Alert for Heart Attacks program consistently opens the blocked arteries of people having a heart attack in less then 90 minutes, the “gold standard” for heart attack care. It's one reason Lehigh Valley Hospital consistently ranks in the top 1 percent in the nation for heart attack survival according to the U.S. Centers for Medicare and Medicaid Services data. If you live outside the Lehigh Valley, we still can help. We’ve partnered with hospitals in Hazleton, Lehighton, Palmerton, Pottsville, Sellersville and Ashland. Our experienced MedEvac helicopter flight crew, along with local ambulance crews, ensure people experiencing heart attack symptoms in these communities get to our hospital as soon as possible. During a directional coronary atherectomy, a thin, flexible tube (catheter) is inserted into an artery through a small incision in the groin. A small blade at the end of the catheter is used to shave off fatty deposits from inside the artery. The shavings are caught within the catheter and removed. Extracorporeal membrane oxygenation (ECMO) helps patients who have a serious condition that affects their heart and/or lungs. With ECMO, blood is drawn from the body through a plastic tube, run through a machine that removes carbon dioxide and adds oxygen, and returned to the body. The patient remains on a low-level ventilator to keep the lungs moving, but because the heart and lungs are not working as hard, ECMO gives them a chance to heal. The left anterior descending (LAD) artery is an essential coronary artery of the heart and is located at the front of the heart. When it becomes blocked, the front wall of the heart isn’t getting any blood or oxygen which can cause death. This is sometimes called a widowmaker heart attack. A blockage of the LAD may be treated with stenting or coronary artery bypass graft surgery. During heart bypass surgery, a bypass is created by attaching a piece of a vein above and below the blocked area of a coronary artery, enabling blood to flow around the blockage. Veins usually are taken from the leg, but arteries from the chest or arm also may be used to create the bypass. Depending on the number of blocked arteries, the surgery may involve one, two, three or more bypasses. If you need heart bypass surgery, you’re in skilled, experienced hands at Lehigh Valley Heart Institute. Our board-certified cardiothoracic surgeons perform more than 1,750 surgeries each year, among the most in Pennsylvania. Because we care for such a large number of people, our surgeons have the experience needed to achieve excellent results, which are consistently among the best in Pennsylvania. They are assisted by nurses and support staff who specialize in heart care. This team of specialists uses the latest devices and techniques to help you feel better faster. If you have diabetes and need heart surgery, your blood glucose will be monitored and maintained at healthy levels during the surgery. This reduces the risk for infection and helps you recover more quickly. An intracoronary stent is a small wire-mesh tube that is placed in the artery to keep it open following angioplasty. Some stents are coated with a medication to prevent blood clots from forming in the area; others are not. Your doctor will talk to you about the kind of stent that is best for you. During a rotational coronary atherectomy, a thin, flexible tube (catheter) is inserted into an artery through a small incision in the groin. A rotating edge at the end of the catheter is used to remove small particles from a narrowed artery. During transradial angioplasty, a thin, flexible tube (catheter) with a tiny balloon at the end is inserted through an artery in the wrist, rather than the groin, and guided into the artery that is blocked. Once at the location of the blockage, a tiny balloon is inflated. This flattens the fatty deposit and opens the artery. This procedure is for patients who cannot undergo traditional angioplasty because they have back problems, obstructive lung conditions or groin arteries that are diseased or scarred from previous procedures.